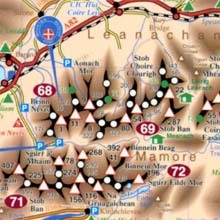 The most comprehensive map of the Munros (Scottish hills over 3,000 feet high) available today, the best selling, full-colour 3000 PLUS has been fully revised, updated and redesigned, including practical new features such as profiles (showing silhouettes of mountains), layer relief and a glossy card cover. The sixth edition of 3000 PLUS, first published in 1980, provides details of all 511 Munro Mountains and Tops, including 90 peaks, such as the recently reclassified summits of Beinn a’ Chroin near Balquhidder, demoted from Munro status since the first Munro Tables of 1891. 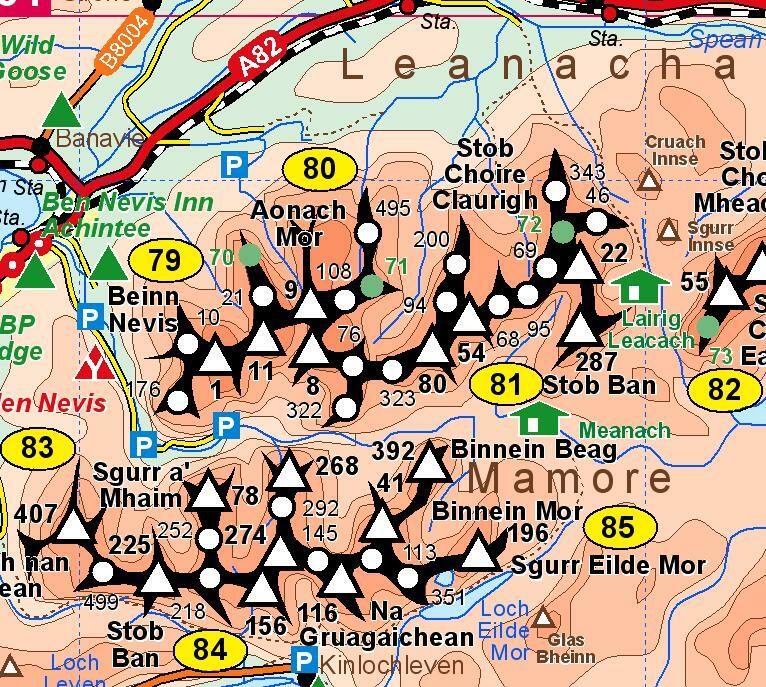 Designed by a hillwalker, for hillwalkers, 3000 PLUS is an invaluable tool to plan and record expeditions, providing an easy-to-use visual record of Munros climbed and those still to conquer. New features include mountain profiles which provide an instantly recognisable silhouette of the mountain ranges and their relative positions. Also new is layer colouring to highlight the relief of Scotland’s rugged mountain landscape and the geographical distribution of summits. 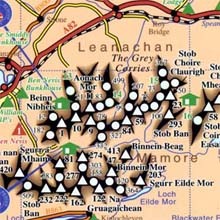 The map also shows details of road, rail and sea routes, hostels and bothies, Outdoor Training Centres, relevant OS 1/50,000 Landranger maps and a simple co-ordinate reference system to relate the Munros to the map and vice versa. Inside the new glossy card cover is supplemental information promoting the work done by The Mountain Rescue Committee of Scotland. The following shows examples of how 3000 PLUS has evolved since 1980 including one or two anecdotes. 3000 PLUS is the original map depicting the 3000 ft mountains of Scotland, first published in 1980. The term Munro can be attributed to (Sir) Hugh Thomas Munro, who catalogued all the summits over 3,000 feet and first published his findings in 1891. This original version, created for my own use, used pen and ink, Letraset transfer lettering and pencil shading. No expense spared! On completion of this prequel (see left), based on information from Munros Tables 1974 (1st Metric Version) published by The Scottish Mountaineering Trust, I gave copies to fellow Munro-baggers, mainly close friends and relatives, for their own use. As it's exposure grew, with positive feedback and numerous requests for further copies, I realised I was on to something. 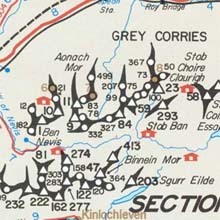 In October of 1980, the first edition (monochrome) of 3000 PLUS was published (see right), also based on information from Munros Tables 1974 (see above). The investment to launch 3000 PLUS came from a bequest from my Grandmother. It wasn't a lot, but it was more money than I'd ever seen in my short life. Therefore you might understand my concern that perhaps I was flushing it all down the toilet with some hairbrained scheme. My objective was to produce a wallchart clearly depicting the geographical distribution of all the summits, communication (road, rail and ferries) and accommodation (hostels and bothies) allowing the user to plan future sorties. Techniques used were fairly basic using pen and ink and Letraset transfer lettering - after all, my windfall wouldn't stretch to anything too grand! The next hurdle was trying to convince the numerous retail outlets to stock 3000 PLUS and thus recoup my investment. So I advertised in the media and through various contacts received a favourable review in "The Scotsman". All this exposure resulted in bumper Christmas sales and my initial concern regarding solvency receded. Actual Size N.B. 3000 PLUS was published using Offset Litho printing technology. However, to facilitate faster Internet access, the resolution of the above image is lower than the final published article. The success of 3000 PLUS in the first year prompted the then secretary of The Scottish Mountaineering Trust, Graham Tiso, to approach me with a proposal to market 3000 PLUS themselves. However, having done all the hard work, I decided to retain ownership but agreed to use their distributor, Cordee, and the first colour edition, based on information from Munros Tables 1981 published by The Scottish Mountaineering Trust, was produced in 1982 (see left). 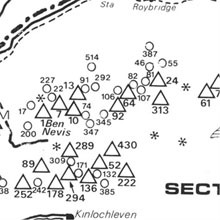 This edition now incorporated a list of the Munros, a list of tops deleted from previous tables (purely for the fanatics among us) and a symbol to help denote ridges and groups of hills. Such was the success of this version that a reprint was required the following year. I would like to thank SMT for their interest in 3000 PLUS - our ten year association gave great exposure to my endeavours when otherwise my initial wallchart might have disappeared without trace. I was now solvent, had a bestselling product and could put my feet up, relax and count the money!...... Not bloody likely!!! In 1984, the SMT produced yet another new set of Munros Tables, altering the recorded heights of many hills. This necessitated changes to the order of summits, the demotion of some hills and promotion of others – and also forced me to publish an updated version of 3000 PLUS in 1985, later reprinted in 1990 and 1992. What happened next was straight from the pages of Whisky Galore. The first consignment of the 1985 edition was delivered to my home in Inverurie – over 70 boxes. I thought there was nothing unusual, but two days later the local constabulary knocked on the door to enquire about reports of stolen whisky. As the policemen lifted the dustsheet from the mountain of boxes in one of the rooms, their suspicions were immediately confirmed: 72 whisky boxes stacked to the ceiling. But as soon as they opened the first of the boxes, their dreams of catching Mr Big were shattered. There was not a drop to drink – my printer in Edinburgh had packed the maps in cardboard boxes bearing the name of one of Scotland’s favourite tipple. There was a further twist to this tale as my printer admitted sending a consignment to South Africa in 'Black & White Scotch Whisky' boxes! In the mid-1990's, I produced the first digital version of 3000 PLUS. The fourth edition, published in 1996 and based on the 1990 Munros Tables was used to promote Scottish Mountain Rescue, emphasising how long it can take to raise the alarm, organise the rescue team, reach the scene, make the rescue and transport the victims to safety. Every map sold also meant a donation to Mountain Rescue. As an added bonus, for the fanatics among us, I researched the first tables published in 1891, including subsequent editions, and created a comprehensive list of any hill considered to be over 3000 feet. Also included was Independent Hostels, a map grid reference system linking the list of summits with their corresponding location on the map and my first experiments with hill shading. The fifth edition, was published in 1998, based on the latest information from the 1997 MunrosTables. The only major change was to list the summits not in order of altitude, but in geographical groups with an associated number easily cross-referenced with the map and expanding the hill shading to other areas of the map. Also included were Corbetts (hills 2500 – 2,999ft). The continuing success and popularity of 3000 PLUS had now attracted several competitors. However, (no bias intended) creditable though some of the attempts have been, none have delivered the depth 3000 PLUS gives. Put simply 3000 PLUS was created by a hillwalker for hillwalkers, not as a commercial enterprise to capitalise on the surge of interest in Munro-bagging. 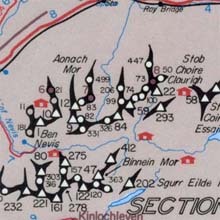 You may well find a less expensive Munro Map on the market, but don't be swayed by a less informative product. Actual Size N.B. 3000 PLUS was published using Offset Litho printing technology. However, to facilitate faster Internet access, the resolution of the above image is lower than the final published article. See Details for clearer image. This Sixth edition, published in 2009 (see left) has been fully revised, updated and redesigned and provides details of all 511 Munro Mountains and Tops. Also included are 90 peaks demoted from Munro status since the first Munro Tables of 1891, such as the recently reclassified summits of Beinn a’ Chroin near Balquhidder. 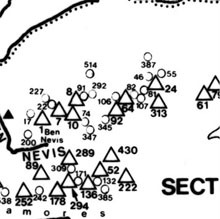 Mountain profiles within the comprehensive list of Munros which provide an instantly recognisable silhouette of the mountain ranges and their relative positions. Layer colouring to highlight the relief of Scotland’s rugged mountain landscape and the geographical distribution of summits. Laminated protective card cover incorporating information on the 75th Anniversary of Mountain Rescue in Great Britain including details on the role of The Mountain Rescue Committee of Scotland.